For other figures with this name, including his paternal grandfather, see Gratian (disambiguation). Gratian (/ˈɡreɪʃən/; Latin: Flavius Gratianus Augustus; 18 April/23 May 359 – 25 August 383) was Roman emperor from 367 to 383. The eldest son of Valentinian I, during his youth Gratian accompanied his father on several campaigns along the Rhine and Danube frontiers. 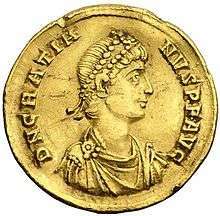 Upon the death of Valentinian in 375, Gratian's brother Valentinian II was declared emperor by his father's soldiers. In 378, Gratian's generals won a decisive victory over the Lentienses, a branch of the Alamanni, at the Battle of Argentovaria. Gratian subsequently led a campaign across the Rhine, the last emperor to do so, and attacked the Lentienses, forcing the tribe to surrender. That same year, his uncle Valens was killed in the Battle of Adrianople against the Goths – making Gratian essentially ruler of the entire Roman Empire. He favoured Christianity over traditional Roman religion, refusing the divine attributes of the Emperors and removing the Altar of Victory from the Roman Senate. On 24 August 367 he received from his father the title of Augustus. 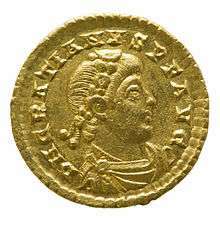 On the death of Valentinian (17 November 375), the troops in Pannonia proclaimed his infant son (by a second wife Justina) emperor under the title of Valentinian II. Gratian acquiesced in their choice; reserving for himself the administration of the Gallic provinces, he handed over Italy, Illyricum and Africa to Valentinian and his mother, who fixed their residence at Mediolanum. The division, however, was merely nominal, and the real authority remained in the hands of Gratian. Gratian's general Mallobaudes, a king of the Franks, and Naniemus, completely defeated the Lentienses, the southernmost branch of the Alamanni, in May 378 at the Battle of Argentovaria. Upon receiving news of the victory, Gratian personally led a campaign across the Upper Rhine into the territory of the Lentienses. After initial trouble facing the Lentienses on high ground, Gratian blockaded the enemy instead and received their surrender. The Lentienses were forced to supply young men to be levied into the Roman army, while the remainder were allowed to return home. Later that year, Valens met his death in the Battle of Adrianople on 9 August. Valens refused to wait for Gratian and his army to arrive and assist in defeating the host of Goths, Alans and Huns; as a result, two-thirds of the eastern Roman army were killed as well. Gratian, under the influence of his chief advisor the Bishop of Milan Ambrose, took active steps to repress pagan worship. This brought to an end a period of widespread, if unofficial, religious tolerance that had existed since the time of Julian. "In the long truce between the hostile camps", writes historian Samuel Dill "the pagan, the sceptic, even the formal, the lukewarm Christian, may have come to dream of a mutual toleration which would leave the ancient forms undisturbed but such men, living in a world of literary and antiquarian illusions, know little of the inner forces of the new Christian movement." He ordered another removal of the Altar of Victory from the Senate House at Rome, despite protests of the pagan members of the Senate, and confiscated its revenues. Pagan Senators responded by sending an appeal to Gratian, reminding him that he was still the Pontifex Maximus and that it was his duty to see that the ancestral Pagan rites were properly performed. They appealed to Gratian to restore the Altar of Victory and the rights and privileges of the Vestal Virgins and priestly colleges. Gratian, at the urging of Ambrose, did not grant an audience to the Pagan Senators. Moreover, he further renounced the title, office, and insignia of the Pontifex Maximus. Notwithstanding his actions, Gratian was still deified after his death. ↑ In Classical Latin, Gratian's name would be inscribed as FLAVIVS GRATIANVS AVGVSTVS. ↑ "Letter of Gratian to Ambrose", The Letters of Ambrose Bishop of Milan, 379 AD. ↑ Zosimus (4.35) indicated that change occurred in Gratian's character when he fell under the influence of evil courtiers. ↑ R. Kirsch, God Against the Gods, Viking Compass, 2004. ↑ Samuel Dill, Roman Society in the Last Century of the Western Empire, 2d rev ed. , Meridian New York, 1958, p26. ↑ Theodosian Code 16.10.20; Symmachus Relationes 1–3; Ambrose Epistles 17–18.